¿Debería estar en el puerto de San Petersburgo por tres días? Vea todos los puntos destacados de esta gloriosa ciudad en una excursión en tierra sin visado de 3 días. 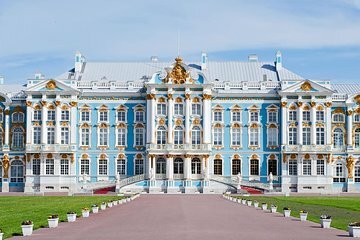 Únase a su guía experto y visite el espectacular Museo del Hermitage, el Palacio de Peterhof y el Palacio de Catalina, incluida su sala de ámbar. Vea las tumbas Romanov en la Catedral en la Fortaleza de Pedro y Pablo, tome un crucero por el canal y visite el Palacio Yusupov, lugar de asesinato del monje Rasputín. Los números están limitados a 15 para una experiencia de grupo pequeño, y su visita de 3 días incluye traslados al puerto y tarifas de entrada. Excursión de 3 días a San Petersburgo sin visado y con guía experto. Maravíllate ante el palacio de Peterhof y sus jardines llenos de fuentes, conocidos como "Versalles de Rusia"
This tour was outstanding. Stan was our tour guide for all 3 days of this visa-free tour. He was very friendly, informative and re-arranged the schedule as necessary to avoid long queues and possible traffic. It was a small group tour of 15 people in a minibus which proved to be an excellent way of moving between the cultural sites. So, all in all it was a great way of seeing St Petersburg. We couldnt have seen wonderful St Petersburg properly without our wonderful guides and drivers. Polina managed to take us to all our museum visits without us having to que and she and Anna were so knowledgeable about all aspects of St Petersburg life and its history. They were brillIant and we enjoyed the three days spent with them. We where a party of 3. We visited St Petersburg with a guide and a chauffeur. Our guide Nathalia was excellent. She describe with passion the history and the splendors of St Petersburg. The 3 days tour was full of beautifull visits, no time lost. The skip the line was verry appreciate. We fully recommand this tour to visit St Petersburg. Alles prima geklappt. Wir wurden am ersten Tag wie geplant nach den Einreiseformalitäten im Terminal abgeholt. PKW mit Fahrer und Reiseführer. Eine sehr angenehme Art St. Petersburg zu erkunden - ohne lange Warteschlangen und mühseliges Ein- und Aussteigen in Busse und warten auf die restlichen Mitreisenden. Die Reiseleitung war ebenfalls spitze und hat uns an den drei Tagen mit ausführlichen Erläuterungen in St. Petersburg begleitet. Jederzeit wieder. after we went through the immigrations area we boarded the van with 12 other cruise passengers and began our journey of St. Petersburg. three days that he couldn't answer. He had a great personality and made our long days in traffic jams fun and a wonderful experience. The driver Alex was a very calm driver and helped make the drive from one point of interest to the next nice and relaxed which is not always the case on tour buses. I thank Aventura Travel for making our visit to St. Petersburg very memorable. Saw so many great things and had a very knowledgeable and experienced guide Stanislavsky who looked after us so well. Although there could have been up to 15 people in our group in fact there were only 4 of us which made the whole experience very efficient and a good use of time with queuing and waiting around kept to a minimum. Fantastic tour! Both guides were knowledgeable and spoke perfect English, and the group was very small and intimate. We were able to skip the lines at the palaces, which was very efficient. On the third day, it ended up being my Mom and I, so the guide took us to extra places not on the itinerary we wanted to visit Dostoyevsky's house, a traditional market, and a Russian Starbucks. Excellent! I cannot recommend this tour enough!! We had a wonderful 3days in St Petersburg when our cruise ship visited here. The tour run by Aventura allowed us to see the highlights at our own pace and would have no hesitation recommending. A word about St Petersburg for ashmatics, we were there in July and the high humidity 90-95 caused my wife to use her inhaler more but nothing serious and would not stop us from returning, Just be prepared.